The story of Philando Castile's deadly encounter with police spread quickly as viewers watched his fiancé's Facebook Live video of the aftermath. We can see what the video shows, but we still don't know many details about what happened that day. As the words of key players in the controversial case show, accounts of what unfolded July 6 depend on whom you ask. 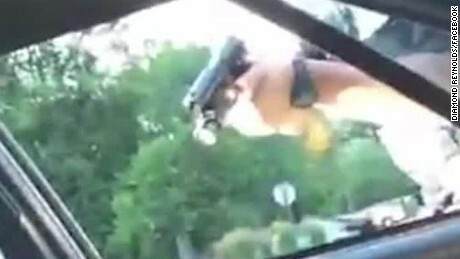 A police officer points a gun through the window of Philando Castile's car window in the Facebook Live video Diamond Reynolds posted. St. Anthony, Minnesota, police Officer Jeronimo Yanez pulled over Philando Castile on July 6. Why? "We got pulled over for a busted taillight." "The driver of the vehicle largely matched the description of (the suspect in) an armed robbery incident that happened in the vicinity several days prior to this stop." Castile had a gun with him, which he was licensed to carry. Yanez and Castile spoke to each other. What did they say? "I told him not to reach for it. I told him to get his hand out." "You told him to get his ID, sir, his driver's license. ... It was in his wallet, his license and registration. You told him to get it, sir. You told him. He tried to tell you he was licensed to carry and he was going to take it off." Yanez opened fire. What made the officer pull the trigger? "During the stop, shots were fired." "As he was reaching for his license and registration, he told the officer that he was licensed to carry. ... The police took four, five shots at his arm for no reason." "There was a gun produced by Mr. Castile. He would not comply with the commands of Mr. Yanez. It had nothing to do with race and everything to do with the presence of that gun. If the gun wasn't present, nothing would have happened here. This would not have happened if not for that gun. This has nothing to do with race." "Would this have happened if the driver or the passengers were white? I don't think it would have." The video shows Castile groaning in the driver's seat as a pool of blood spreads on his shirt. What happened afterward? "Was there a delay? There's a question about whether he was taken to the closest trauma center. There are a lot of unanswered questions." "They took me off the scene. I was not allowed to talk to anybody and up until 5 o'clock this morning when they dropped me off on my doorstep. ... I was not released until 5 o'clock this morning when I arrived at my house with two squad cars. "They separated my daughter from me, they didn't feed us, and they tried to place the blame like it was something that we did." "Philando was not given first aid. Nobody attended to his condition as they were attending to the condition of the police officer who did the shooting. (Reynolds) was handcuffed, taken to the police station with her 4-year-old daughter. Just stark treatment, just I find absolutely appalling at all levels." "Our officers didn't know who had shot whom. It was a chaotic affair. There was a lot of things going on that they had to work through. By 9:10 pm., so three minutes after they arrived, they started to perform CPR on Mr. Castile. ... It hurt me, as the Roseville police chief, to hear the governor of Minnesota saying that Mr. Castile did not receive CPR." "(Reynolds) wasn't held all night. She was held for just about two hours. ... I think that she was taken care of with professionalism, with courtesy, with humanness, with kindness. I can't imagine the sheer terror and the panic she was going through, seeing her fiancé go through that. But we did what we could to try and humanize it and make it as painless as we could." CNN's Rosa Flores, Brynn Gingras and Linh Tran contributed to this report.